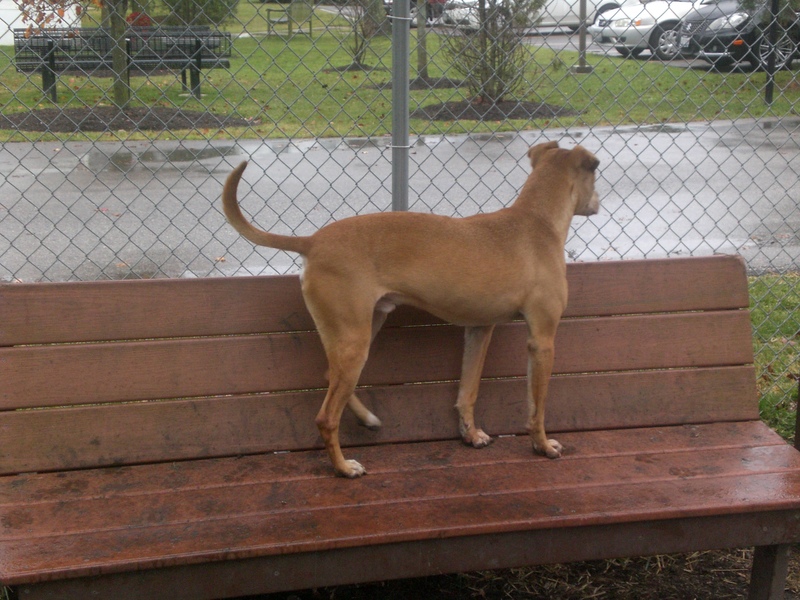 It was a dreary day outside, but that didn’t dampen these dogs’ spirits! A little bit of playing in the mud never hurt anybody (even though I now have a muddy paw print on the toe of each shoe). Buddy the two-year-old Boxer mix was incredibly excited when I came up to him with the leash. This guy has been catching my eye every time I’ve visited Orphans of the Storm® because he just looks so friendly and happy. You can’t help but smile when you see him. Buddy and I went to one of the runs, and the other run was occupied by Bubba. 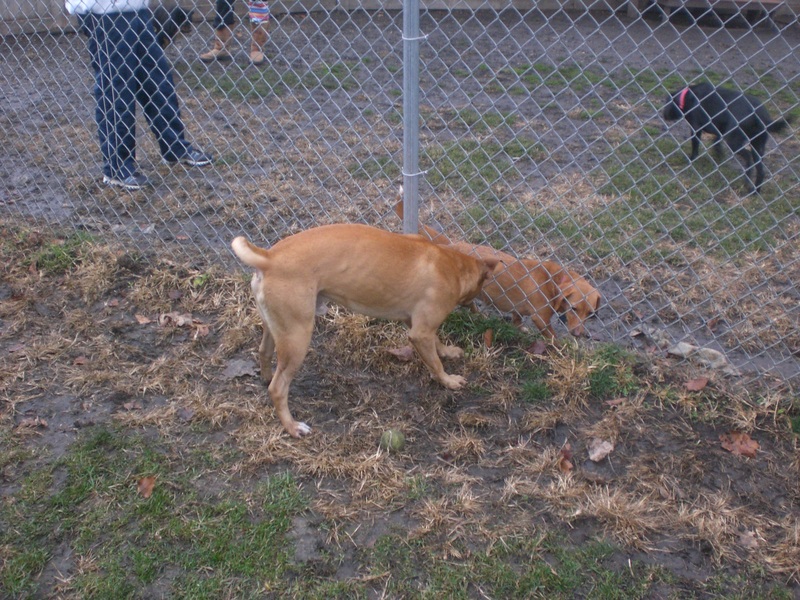 Buddy and Bubba met each other at the fence and did a little sniffing, and then Buddy meandered around the run. After Bubba left, a group of three dogs and two humans came to the run. One of the humans said that she was very interested in Buddy because he’s so cute. His light brown eyes match his fur almost perfectly, giving him a unique (and adorable) look. He can be pretty strong, and likes to go in his own direction, but he is capable of being a good listener. 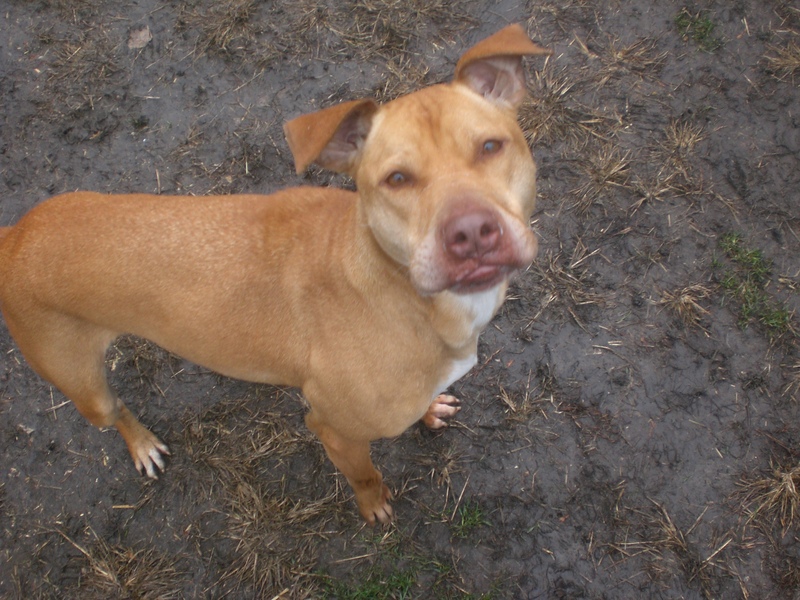 Rocky the three-year-old Labrador Retriever/Pit Bull Terrier mix is a complete lovebug. When I first took him out of his kennel, he jumped straight up and our noses met. After that one brief moment of excitement, though, he was as cool as a cucumber. He didn’t pull on the leash on the way to the run, and didn’t jump up again. Rocky definitely inherited the Lab personality traits. He kept trotting over to stand next to me so I could pet him. He particularly likes being scratched on the side of his neck. 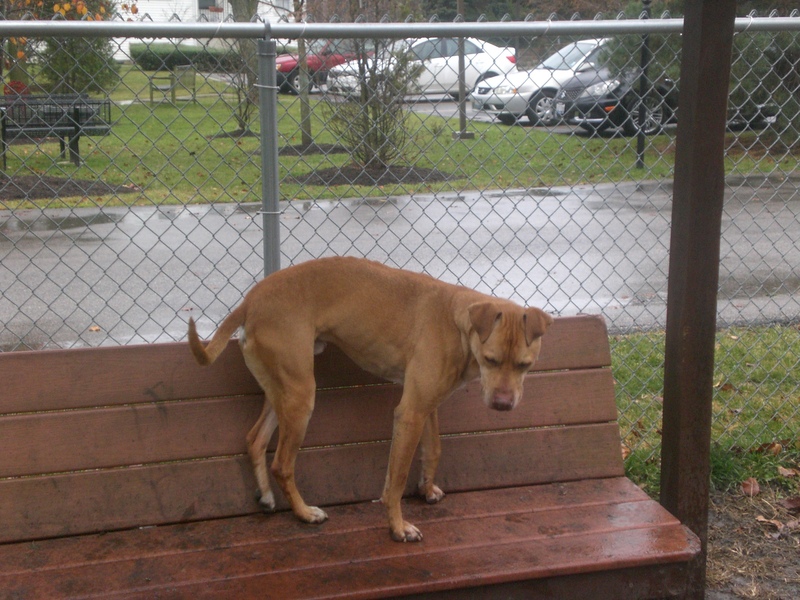 At one point, he jumped onto the bench and took a seat. It was almost too cute to handle. I went over to pet him and he kept looking up at me with those warm brown eyes as if to say, “Look at what a good dog I am!” I, of course, told him repeatedly that he is indeed an excellent dog. Such a sweetie! 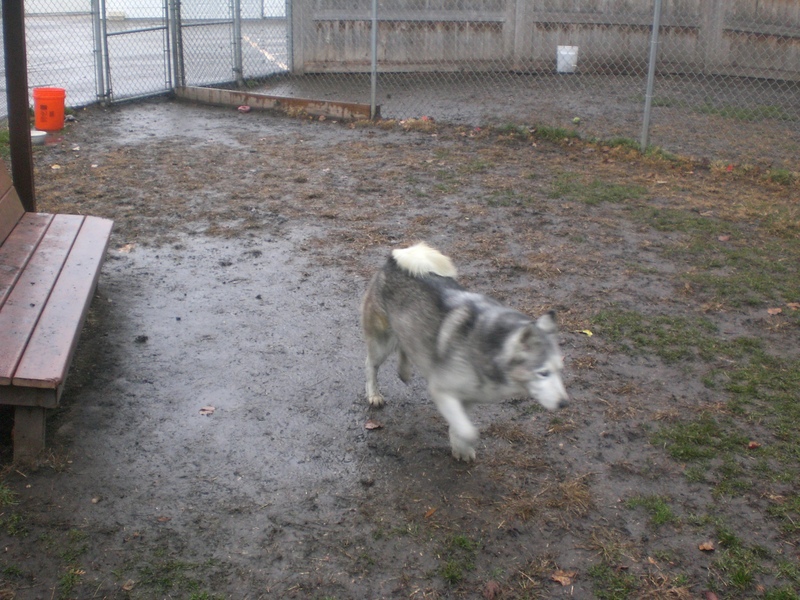 Akiva is a beautiful seven-year-old Husky mix. She hasn’t been at the shelter for very long, and I expect that she will be adopted very soon with her looks and personality. 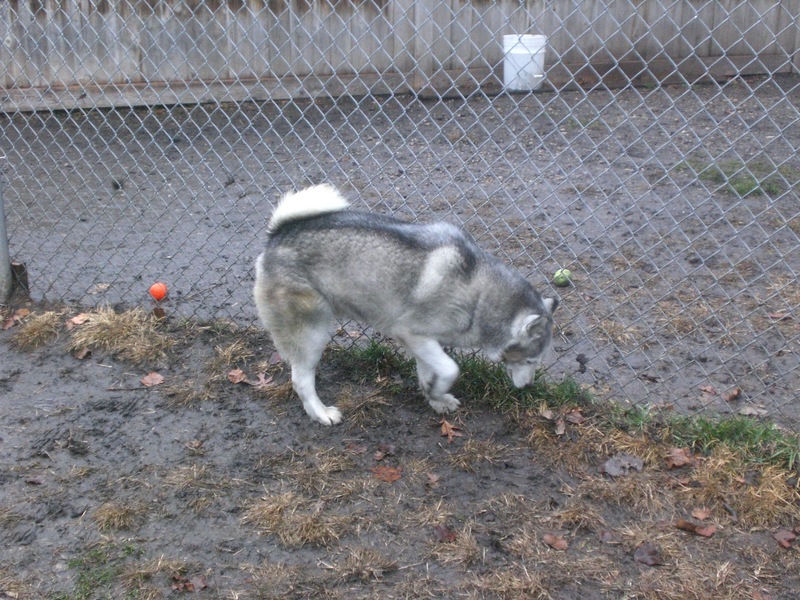 Like many Huskies, Akiva has stunning bluish-gray eyes. 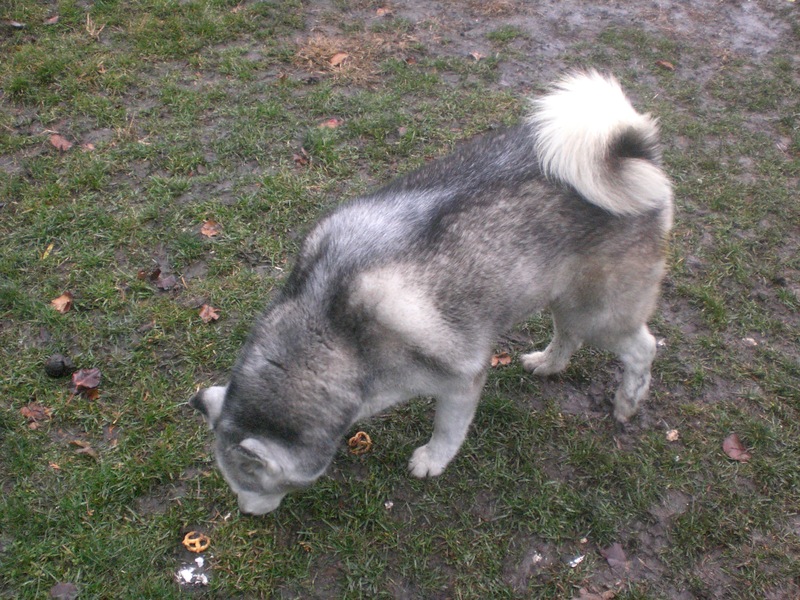 Her thick, fluffy fur is varying shades of white, gray, and black, and shimmers as she moves. Her perked ears are mostly white, but have black tips. She walked extremely well on the leash, so after spending some time hanging out inside the run, I decided to talk her on a walk around the property. She seemed to enjoy this more, and we had a good time on our stroll in the drizzle. Please note: Orphans of the Storm® has extended hours all through December to share the holiday spirit! This month, the shelter will be open from 11am-8pm Thursdays-Sundays. If you want to get to know your new best friend with festive music in the background, you can stop by Thursdays-Saturdays from 6pm-7pm and Sundays from 2pm-3pm for the live music hour. Human food and drink available! 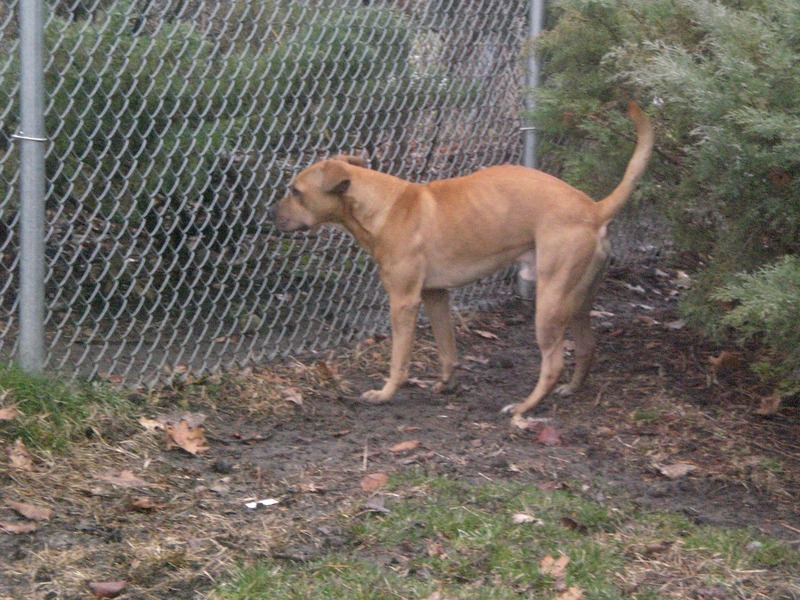 Posted by Meet the Pooches on December 6, 2011 in Dog Profiles and tagged adoption, animal shelter, Boxer, Chicago, dogs, Husky, Labrador Retriever, Orphans of the Storm, pets. Hi Amy! I am enjoying these posts very much and am grateful that you are helping to get all the awesome dogs at Orphans homes! My husband and I walk dogs there and have adopted two. We were wondering if you could feature Tyson in cage #57 sometime. He is a great dog! Thank you for the suggestion! I will definitely add Tyson to my list. Amy, thanks for all you are doing for the oprhans! I keep looking for Izz;y to get adopted but he is still there. Thanks for featuring him with Duvall. From the short time I spent with Izzy, I think that he has real potential to be a wonderful pet. The staff member that I spoke to said that he’s a little wary with strangers but after a day in a new home, he should settle right in. I didn’t hear anything about Izzy having a bite record, but the staff member told me that Duvall had bitten before – for protective reasons, not aggression. If you’re still interested in Izzy, I would highly recommend going back for another look and spend some more time with him so you can see how you two get along. I would also ask one of the staff or volunteers to get out his record to verify if there have been any instances with biting. Or, if the ‘he’ you were referring to was Duvall, I would again recommend talking to one of the staff there to get more information on his history. He didn’t show any inclination to bite or even growl when I was with him, but it’s good to get as much information as possible and definitely spend some time with any dog before making the decision to adopt. 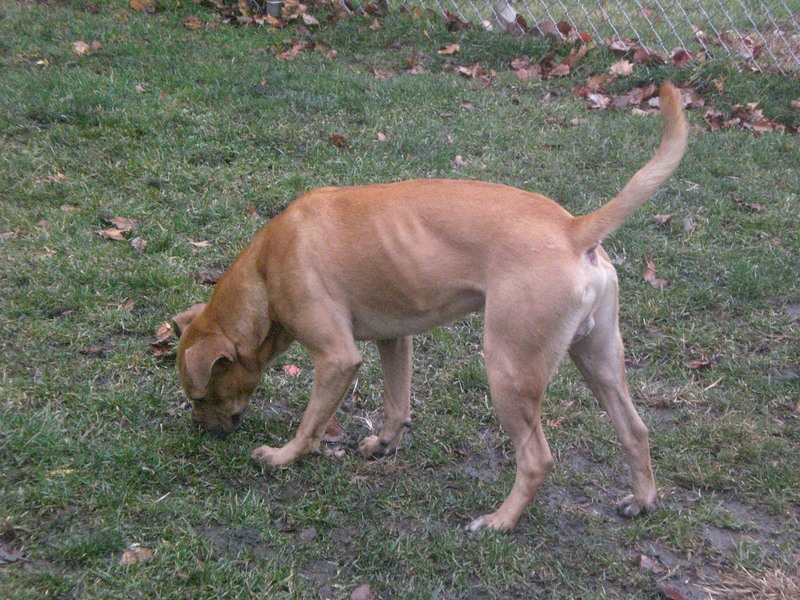 We want every new home for these dogs to be a forever home! I can try! What’s your question? I run a rescue in Omaha and someone emailed me about Akiva. They said she has been at the shelter for 4 years is that right? Thank you for the work you do! Akiva has been at the shelter for at least two years, which is how long I’ve been volunteering there… I’m not sure exactly how long she had been there before I started, though. and Akiva has a health issue where she is contsantly peeing? What does the vet think that problem is. It isn’t constant, but she does have urinary incontinence, so her future owners would probably prefer to keep her in a doggy diaper to avoid accidents in the house (which isn’t that uncommon, especially with older dogs).